As I write this at 8:00 in the evening, our thermostat is still reading 83°. We do not have air conditioning since we don't normally need it - except for the few really hot days like today that we get each summer. 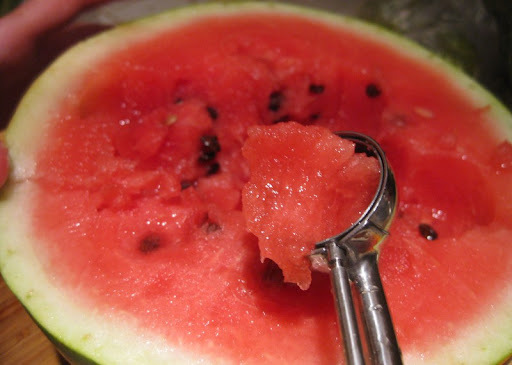 When it's hot, there's nothing quite like the cool, refreshing taste of watermelon. The one pictured above is probably the best we've ever had. It is from Maciel Family Farm - one of our favorite vendors at the Pacific Beach Farmers Market. You can't see it in the picture above, but the skin color was rippled with a deep, rich green - not washed out like you tend to get with an average supermarket melon. Cutting it in half revealed a beautiful ruby red flesh that seemed the perfect embodiment of Summer. And the taste? Pure heaven. Intensely sweet - but a clean, pure kind of sweet. It was really great in a fruit salad, but the best bit was definitely those first few scoops straight from melon to mouth. Last year my father in law grew what everyone agreed was the best watermelon ever tasted. My (then 3 year old) grand daughter will probably go through life holding all melons to that standard and find them all lacking. summer came out of no where...was a bit gloomy last week, now it's hitting 100+ over here. i love watermelon...my favorite fruit and def. one of my favorite things about summer. i don't have a scooper, but maybe it's about time to invest in one. beautiful picture! Hi David, food snob at age 3 - pretty impressive! Sawyer - yeah, it has been crazy hot. Still is, but it finally looks like we're getting a marine layer rolling in tonight to cool things off a bit. Hi Mike - We don't have A/C either, like you, there are usually only two - three days a year when we wished we had it. But this time it's been an entire week, that's looking like it'll stretch into two! Nice watermelon shot...I think it's time for a watermelon gazpacho! Hi Kirk - we've never tried watermelon gazpacho - sounds refreshing.